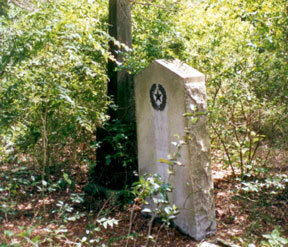 This cemetery is on private property about nine miles north of La Grange on the old John Henry Moore home place. According to Zoe Philips Harris the First Christian Church was also located here. To reach the site take Hiway 77N to the Nechanitz (FM 2145) turn off, turn right and continue 4 miles--look for a concrete entrance on the right and take that gravel road for 1.7 mile. Just before you get to the cattle guard which is at the top of the hill, turn left and you will find the cemetery about 200 yards from the cattleguard down the fence line. John H. Moore purchased a quarter league of land from J.R. Philips on July 13, 1838 thereby establishing the Moore Plantation including the Moore Cemetery. The oldest marked burial is for John Henry Cook, grandson of John Henry Moore, who died 10-23-1867. Malinda Gest's obit states that she was buried at the Mecklenburg Cemetery in 1923. Annie Brandstetter's obit states she was buried on the Hall farm near Mecklenburg in 1925. Norman Krischke's report from 1964 states those 4 unidentified graves inside the fence with Daniel Schultz's grave are supposed to be the grandparent's and baby half-brother of Daniel's son Barney. Krischke also states that there are slaves buried in front of J.H. Moore's historical marker and his grave. Barney Schultz also told Krischke that Brandstetter's are buried here as well as children of Robert and Fannie Brandstetter Albers of Waldeck. John Henry Moore, original grantee of the league of land on which La Grange stands, is buried here and has a 1936 Texas Centennial marker. Kathy Carter, Helen Muras, & Annette Ruckert were unable to find the cemetery when we searched in May of 1990. Others have found the site and still report on its deplorable condition. Names and information listed were compiled from several sources: Joe Cole report of 1959, N. Krischke report of 1964 & revised in 2000, handwritten list of names from unknown source, undated report of Mrs. Zoe Philips Harris, family sheets of Seth D. Breeding, and research into death records and obits by Kathy Carter in July 1993 and April 1994. There are probably many unknown burials here. Several of the names listed below do not have stones. 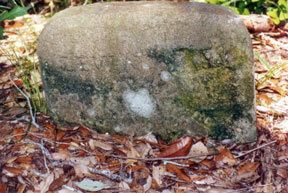 Some stones do not have inscriptions as complete as the ones listed. See the booklet,"John Henry Moore, Moore Cemetery," by Norman C. Krischke, c2000, for additional information. John H. Moore purchased a quarter league of land from J.R. Phillips on July 13, 1838 thereby establishing the Moore Plantation including the Moore Cemetery. The first known burial here was that of John Henry Cook who died October 23, 1867. No doubt there were slaves buried on the cemetery prior to the stated year. There are many depressions suggesting graves 70 to 80 feet east of John H. Moore's tombstone said to be slaves who were freed 1 January 1863 by the Emancipation Proclamation, projected to 19 June in Texas. It is believed many of the slaves hired on for food, clothing, lodging and a small stipend to keep the plantation going. Mr. Krischke's booklet contains much more information on the Moore Plantation and can be found in the Fayette Heritage Archives and Museum. This house was built in 1838 as a residence for Colonel John H. Moore and his wife Eliza Cummins Moore. Colonel Moore, a noted Indian fighter commanded the Texians at Gonzales, October 2, 1835 when the first shot of the Texas Revolution was fired. * 19 unknown graves. 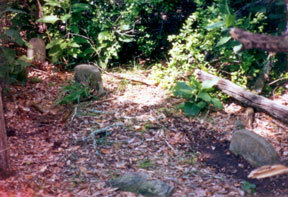 (Mrs. Barney Schultz stated 3/6/1964 two of the graves are children who burned to death at Rutersville. 1) William Gest, aged fifty-four years, died at his home near Nechanitz Saturday 8/1/1920, following an illness that had extended over a period of several months. Sunday afternoon the remains were interred at the neighborbood cemetery, a large number of his friends and acquaintances being present to pay their last respects. Deceased leaves a wife and twelve children, a majority of whom are grown. To these we extend our sincere sympathy. The La Grange Journal, 3 Aug 1920. 2) Funeral Home Marker still has paper with names and dates but is unreadable. Someone copied the name and dates years ago when paper was readable. Last grave in the cemetery. Fayette County Death Record, VOL 4, page 151, states she died of hemorrhage of the brain and that she was the daughter of William and Olga (Brandstetter) Gest. Obit: Miss Malina Gest, daughter of the late William Gest, died very suddenly at the home of her mother orth from LaGrange, Wednesday, 13 July 1923, at the age of sixteen years, ten months and three days. Miss Malinda had, so we are informed, eaten her breakfast and gone later to the yeard where she collapsed and died within a few moments. The funeral was held Thursday, Rev. R. Heise officiating, with interment at the Mecklenburg Cemetery. Surviving are her mother, seven brothers and four sisters, and a large number of other relatives. La Grange Journal, 26 Jul 1923. 3) F. R. Lange of Warrenton, who came to La Grange Friday morning informed the Journal that Daniel Schultz of Walhalla, aged about thirty-nine years, died very suddenly at his (Schultz's) home Wednesday of last week, October 7, 1912. Deceased was in good health and very jovial the day previous, and to all appearances was holding a long lease on life, but was stricken with heart failure during the night and died within a few hours. The remains were interred Thursday. La Grange Journal, 17 Oct 1912. 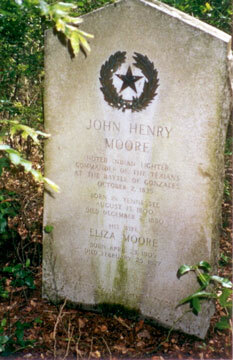 4) This is John Henry Moore, III, son of John H. and Nellie (Bradshaw) Moore, Jr. Tombstone shows: "Jr". 7) Son of D.P. and M.E. Croft. 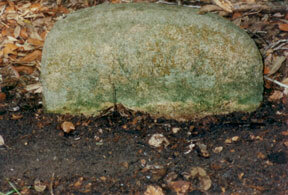 Dual stone with John R. Croft. 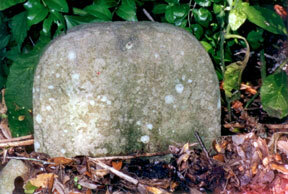 8) First grave according to tombstone inscriptions. Most likely the first grave here was in the 1840's "Only and idolized child of R.V. and Eliza Cook...Aged 5 yrs, 11 mos and 11 dys"
9) Daughter of John H. and Eliza Moore and wife of R. V. Cook. Married Richard V. Cook on 11/21/1859. 10) Nee Philips, wife of John W. Killen, married 12/9/1875, daughter of J.T. and Lucy A.E. (Darnaby) Philips. 11) Well Known Citizen of Fayette County Shifts Earthly Coil: Saturday afternoon, 9/27/1919, at the home near Rabb's Prairie, John W. Killen, for many years a resident of that section, passed to his reward, following an illness which had lasted for two weeks. Prior to this he had always enjoyed good health. He passed the Holy Writ allotment of three score and ten years last April. John Killen was a man who ever sought the sunshinny path of life; gifted with a strong sense of humor, possessing a big charitable heart and kind disposition, one was drawn to him, knowing that underneath the apparently outer surface beat a true heart of a man. One referred to him not as an enemy, but as a friend. He was of the old type of the old-school of southern hospitality, where the only loaf left was shared with the needy. Sunday afternoon they placed his silent body in the cemetery in the neighborhood of his home, to remain until another shall pass judgment. The surviving, who mourn the loss of a father are: Mrs. C.M. Breeding, Mrs. F.B. Flores and Mrs. William Fisk of San Antonio; W.B., R.T., J.R. and F.R. Killen of Humble. La Grange Journal, 2 Oct 1919. 12) Philips Plot, William Lemuel Philips. Grave frame dual stone with Tennie P. Philips. Obit: William L. Philips, 93, Expires in Houston - William L. Philips, 93, of Houston but a native of La Grange, passed away on Monday of last week, 12/29/1952. Funeral was held at the Koenig Funeral Home Chapel Wednesday, December 31, at 2 p.m. with Rev. J.H. Mitchell officiating and interment was made in the Moore Cemetery near LaGrange. Mr. Philips was born here on December 20, 1859 and was united in marriage with Miss Tennie (Tennessee) Brown. His wife preceded him in death in 1926. Mrs. Philips lived in Houston for the past eight years. He leaves three daughters: Mrs. Estelle Cook of Wichita Falls, Mrs. Maude Rauch of Houston and Mrs . Louis Smith of Beaumont; five sons: Lt. Col. Vincent Philips of San Antonio, Wm. T. of Marshall, Clyde C. of Beaumont, Walker of Gonzales and V. L. Philips of Corpus Christi; 17 grandchildren and 8 great grandchildren. La Grange Journal, 9 Jan 1953. 13) Nee Brown, Tennessee, daughter of Franklin C. and Harriett Brown. Obit: Mrs. Tennie Philips - In our brief mention last week of the death of Mrs. Tennie, wife of Wm. L. Philips of Indian Creek, we could not give any of her biographical sketch, due to the limited time before going to press and the meager facts at our command. A friend has kindly sent us the following: Mrs. Tennie Philips, who was a good Christian woman, died at the family home at 3:30 o'clock on the afternoon of September 14. Funeral services were conducted by Rev. Paul W. Evans at five o'clock, Wednesday, September 15, and interment took place at the Moore Cemetery. Mrs. Philips was born in Parker County, November 15, 1862, a daughter of Franklin C. and Harriett Brown and removed to Fayette County when a small child. She was united in marriage with Wm. L. Philips on August 18, 1884 at Stellar. To this union was born eleven children, nine of whom survive. These are: Vincent of Waco, Thompson of Marshall, James T., Clyde, Walker and Mrs. F.M. Rauch of La Grange, Mrs. T.F. Cook of Houston, and Vastine and Mrs. Louise Smith of Beaumont. One brother and two sisters: Prof. J.S. Brown and Miss Moie Brown of San Marcos and Mrs. Jane Pickard of Weatherford. Deceased united with the Christian Church at the age of thirteen years, and was an active member during her life after that. We commend her spirit to the Good Lord and bid her rest in Peace. La Grange Journal, 23 Sep 1926. 14) Son of Ezekiel T. Philips and Elizabeth Thompson Brown. Born in Franklin Co., Tennessee. Brass Military Plate: John T. Philips Tennessee, PVT, CO.E., 3 REGT., TENN INF, MEXICAN WAR. Dual stone with Lucy A.E. Philips. Obit: At his home seven miles north of LaGrange, Texas, on May 8, 1907 after an illness of several weeks, the spirit of John T. Philips, one of the oldest and most respectable citizens of that vicinity, made its departure to the great beyond. Deceased was honored by all who knew him, was a devoted member of the Christian Church, "praising God, and having favour with all the people," (Acts: 111.47) and continued in the faith of the Redeemer until death claimed him. John T. Philips was born September 24, 1823, in Franklin Co., Tenn. and united in wedlock to Miss Lucy A. Darnaby October 8, 1850, and came to Texas about two months after their marriage. At the age of twenty-three he enlisted and served in the Mexican War, and at the age of forty, enlisted in the Confederate Army. Eight children blessed this union and all lived to the age of maturity. He leaves surviving him a wife and four children, viz: Mrs. H. H. Turner of Marshall, Texas, Mrs. T.H. Breeding, W.L. and Thomas Philips, who reside in the vicinity of the old homestead. Also thirty-six grandchildren and six great grandchildren. Mr. Philips was 83 years, 6 months and 14 days of age at the time of his death. May he rest in peace. La Grange Journal, 23 May 1907. 15) Lucy Ann E. Darnaby, daughter of Reuben Darnaby and Elizabeth Fagg. Born in Franklin Co., Tennessee. Married John T. Philips 10/8, 1850 and came to Texas in 1850. Dual stone with John T. Philips. Obit: Mrs. Lucy A. Philips, Another Landmark Gone - Died at her home, eight miles north of La Grange on 6/3/1909, Mrs. Lucy A. Philips. Deceased was born in New Market, Ala. onn 10/16/1827. On October 3, 1850, she was married to John A. Philips (note the change in middle initial) at Winchester, Tn. and the same year moved to Texas, arriving at La Grange December 25. During the following year they moved to the country where she resided continuously until death claimed her. Eight children blessed their union, four of whom are living, viz: Thomas J. Philips, William L. Philips and Mrs. Thomas H. Breeding, residing near the old homestead and Mrs. H.H. Turner of Marshall. The deceased children are: John W., James H., and Miss Emma Phillips and Mrs. Lucy Killen. Deceased was a highly respected lady, one who was loved by all who knew her and had been a consistent Christian since childhood. May her rest be peaceful. La Grange Journal, 10 Jun 1909. 18) Wife of John T. Rogers, on her marker: "Her infant daughter Lies to the Left"
19) No data, Daughter of John T. and Mary E. Rogers. Info from Mary E. Rogers' tombstone. 20) No marker. Mrs. Barney Schultz stated 6 March 1964 that Brandstetters are buried here. Alex Brandstetter, an aged farmer residing out on the farm known as the Moore Farm did early Friday morning 17 September 1909. The funeral was held the next day. He leaves a wife and four children, beside many friends to mourn his departure. La Grange Journal, 23 Sep 1909. Friday last, January 2, 1925, Mrs. Annie Brandstetter, nee Daus, died at the farm home near Waldeck, following an illness extending over two months. Deceased was born near Berlin, Germany November 3, 1847, and when only seventeen years of age, came to Texas. Her remains were interred Saturday on the Hall farm near Mecklenburg, Rev. Heise officiating. Mrs. Brandstetter leaves to mourn her going five daughters: Mesdams Olga Gest, Emmie Schaefer, Eliza Ehrlich, Hattie Schultz, Fannie Albers, and one son: Grover Brandstetter. These surviving children hav the sympathy of their friends and acquaintances in this their hour of grief. The La Grange Journal, 8 Jan 1925. 22) Mrs. Barney Schultz stated 6 March 1964 that children of Robert Albers, Constable at Waldeck, are buried here. All Moore Cemetery photos taken May 11, 1991 by Carol Behringer. Carol also supplied the photo captions from her research. died May 21, 1862, Fayette County, Texas. See John H. Moore Biography from the Dallas Morning News Magazine. Thank you, Stephanie Warren, for retyping Mr. Krischke's data for this web page!